Get off the beaten path or away from standard tourist traps by visiting these offbeat and unusual attractions in Maryland. There is something here for everyone and you are sure to have a great time exploring. Here are the 15 most unusual attractions in Maryland. Pirate ships. Ahoy, matey! Play like a pirate in Baltimore’s Inner Harbor. Kids love climbing aboard classic ships and playing pirate. While these particular ships may have been shipping vessels, a ship is for pirates with only the slightest bit of imagination. Yes, that John Wilkes Booth. After being killed for assassinating President Lincoln, his body was laid to rest in Baltimore. The commended Shakespearean stage actor assassinated Lincoln on April 14, 1865. Booth was killed when he refused to surrender on April 26, 1865. Hunting for birds is a classic Maryland tradition and Havre de Grace is the decoy capital of the world. The famous and completely odd Decoy Museum is home to a large collection of duck decoys and other folk art. Have you ever wanted to join a dig and uncover the next greatest dinosaur? Fossils are everywhere in Maryland. When you visit Laurel, there is a Dinosaur Park where a large deposit of fossils still remain. It is fenced off so you need to go during visiting hours. This is a 125-miles of scenic roadway that commemorates Harriet Tubman’s journey to free the slaves. Born in Maryland, Tubman is a hero and along the byway you can see spots where slaves would hide while making their way to freedom. If you or the kids love the show, drive by the giant waving SpongeBob found on Bowles Farm in Clements. It’s huge. You can’t miss it. Don’t forget to wave back. No joke, part of his skull is in a museum in Silver Spring, Maryland. The National Museum of Health and Medicine is certainly unique and a must-visit for any doctors in the family. If you’re a comic book fan, the Geppi Entertainment Museum is an essential stop if you find yourself in Maryland. You will see some of the most expensive comic books ever. Rare doesn’t even begin to describe this collection. This is not just an art museum. This is a quirky and slightly crazy museum where you will see modern art that is anything but boring. Its creating, interesting, and you can’t help but enjoy being here—trust us. 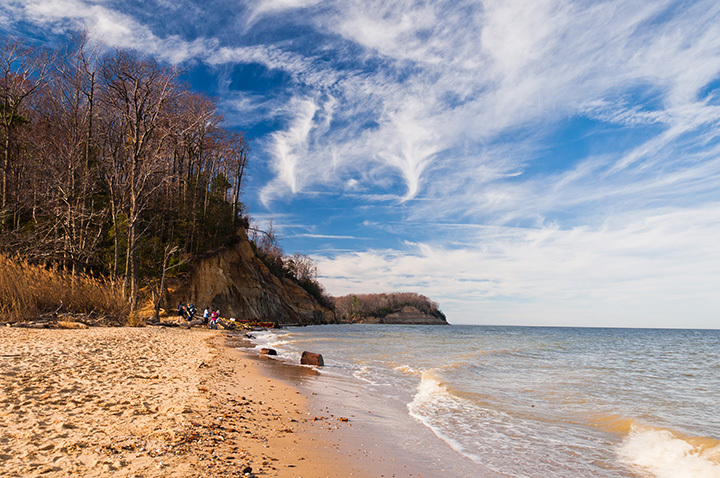 It’s a hike down to the beach but this is where locals and tourists go to hunt for fossils. If you bring a small shovel and some patients, you will not be disappointed. Shark teeth and more are being discovered daily and the view from the beach is both pristine and spectacular. Who doesn’t love a great wax museum? What sets this one apart is that it is all about black history. It’s a creative way to teach your kids about heroes like Malcolm X. The oldest, tallest building. Okay, so it is no Empire State Building but once upon a time, the tallest building in America was in Baltimore. Still standing, the Phoenix Shot Tower is tall and truly a sight to behold. Far from Mt. Ararat stands Maryland’s Noah’s Ark. In 1974 a pastor was told to build the ark and has been working on its construction ever since. You can see it while driving by on the interstate in Frostburg and it is the site of many reported miracles. In Silver Spring, you will find a memorial bust to their homeless mayor. While not technically the mayor, he was beloved throughout the city and is fondly commemorated here. Visit the United States Naval Academy to see the John Paul Jones Crypt. The father of the American Navy, he is celebrated here and the crypt is spectacular. And if you’re looking for something a little bit spooky, but also historical, this is an ideal spot for you.